As a frequent trainspotter at Durham Station, I got to know most of the staff quite well. I would often end up on the footplate of the steam banking engine – with complete approval of all but the Railway Police who just turned a blind eye. If I agreed to carry the daily water supply to the signal boxes, I was allowed to travel in the guards van. This is how it worked. After the last of the rush hour trains heading south each morning that all needed banking out of the station, the banker would go to the old engine shed site and pick up 2 blue spot fish vans and a goods guards van and shunt them into the parcel bay at the south end of the station. I would have to take the water churns (galvanised steel about 5 gallons capacity) and fill them in the Left Luggage Office with the help of the attendant Billy White. When the 5 churns were loaded we would head out over the viaduct, taking the Bishop Auckland line at Relly Mill Junction. At Deerness Valley Junction I would take one of the churns up the long steps to the signal box returning with the empty one, while the engine would go into Broompark sidings a drop off the fish vans and run round the guards van. Then it would be off to Baxter Wood Nos.1 & 2 Signal Boxes where I delivered the water and again collected the empties. Then it was under the bridge of the Bishop Auckland line to Bridge House Signal Box on the main line for another delivery, finally heading back to Relly Mill for the last water delivery. It was then hell-for-leather back to Durham to drop off the guards van and cross all the tracks at Durham North Signal Box in time to bank the 10.16am to Kings Cross. Sundays was slightly different because there was more time to do it and each box got a delivery of signal oil (paraffin) for the signal lamps and often one of the Baxter Wood boxes would be closed (switched out). It was on my first trip to do this in about 1957 that I found the added attraction of Relly Mill with all the traffic on the Consett line in addition to the main line. Miner’s Gala day was always worth a visit. I usually went there after all the banners had gone in and before they started coming out again because every available siding in the Relly Mill area had passenger trains stabled awaiting return to Durham. Standing on the road bridge you could see at least 20 passenger trains and their engines all sitting quietly awaiting their next turn of duty. 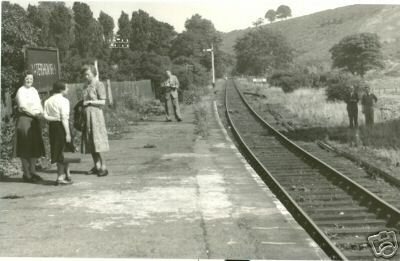 Early photo of Waterhouses Station which was actually situated in Esh Winning. BISHOP Auckland-based author John Swain has released Railway Walks Two: Branch Lines Around Durham City. The booklet covers Ushaw Moor, Waterhouses, Witton Gilbert, Lanchester, and the former route to Hetton and Murton junction from Durham Elvet. Copies, priced at £9.50, are available from shops in Durham and Bishop Auckland. To order from Mr Swain, write to: 38 Rochester Close, Bishop Auckland, County Durham, DL14 0RJ, and include £1.50 for postage. via Author releases railway walks booklet (From The Northern Echo).